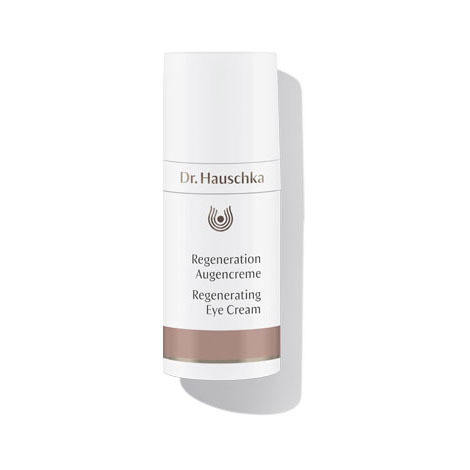 Regenerating Eye Cream refines the delicate skin around the eyes, reducing the appearance of fine lines and wrinkles. This rich cream invigorates skin while supporting natural skin regeneration. Formulation: Quince seed, birch leaf and borage refine pores and balance moisture. Acerola berries and sea buckthorn join red clover to enhance skin tone and elasticity. Shea butter and botanical oils replenish, soften and protect. Precious botanical extracts offer the eye area renewed vitality. Each morning after cleansing, toning and moisturising, pump a little Regenerating Eye Cream onto the tip of your ring finger and gently apply around each eye, working from the inner corners outward. This fast-absorbing cream is ideal for use before applying eye make-up. Regenerating Eye Cream is ophthalmologically tested and suitable for contact lens wearers. Water (Aqua), Pyrus Cydonia Seed Extract, Glycerin, Simmondsia Chinensis (Jojoba) Seed Oil, Macadamia Ternifolia Seed Oil, Sesamum Indicum (Sesame) Seed Oil, Helianthus Annuus (Sunflower) Seed Oil, Betula Alba Leaf Extract, Bellis Perennis (Daisy) Flower Extract, Alcohol, Rosa Damascena Flower Water, Hectorite, Equisetum Arvense Extract, Lysolecithin, Glyceryl Stearate Citrate, Beeswax (Cera Alba), Butyrospermum Parkii (Shea) Butter, Borago Officinalis Seed Oil, Glyceryl Caprylate, Theobroma Cacao (Cocoa) Seed Butter, Fragrance (Parfum)*, Limonene*, Citronellol*, Linalool*, Geraniol*, Farnesol*, Benzyl Benzoate*, Eugenol*, Citral*, Benzyl Salicylate*, Cetyl Alcohol, Trifolium Pratense (Clover) Extract, Hippophae Rhamnoides Fruit Oil, Chondrus Crispus Extract, Xanthan Gum, Triticum Vulgare (Wheat) Bran Extract, Oryzanol, Sucrose Stearate, Sucrose Distearate, Malpighia Punicifolia (Acerola) Fruit Extract. An effective product for mature skin. Expensive, but, it does last. Discover the full Regenerating line with the Regenerating Skin Care Kit.